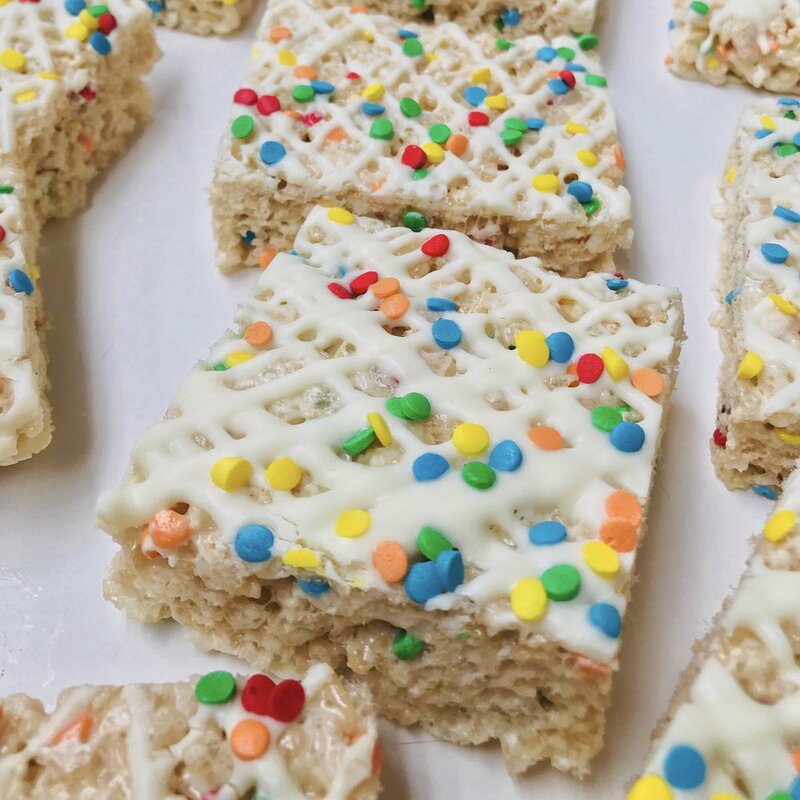 These birthday cake Rice Krispie treats are quick, easy, and super delicious! Perfect for a summer bbq, or a birthday party, this is a treat the whole family will love! 1. Line a pan with parchment paper and then spray well with non-stick cooking spray. I typically use a 9x13 but the size doesn't really matter. (bigger pan=thinner treats) Its important that the pan is well greased otherwise the Rice Krispie treats will stick to the paper. 2. In a large non-stick pot, melt butter and marshmallows over low heat. When melting, it is important to stir often so that the marshmallows don't burn and stick to the bottom. Add the vanilla extract and stir. 2. Mix in Rice Krispies and Sprinkles. Once everything is well combined, quickly transfer to your prepared dish. To easily spread the Rice Krispies around in the pan, slightly wet your hands and flatten the treats. You can also lay a piece of greased parchment paper over the top of the treats and flatten the with a rolling pin or any other flat object. 3. The best way to melt the white chocolate chips is in a double boiler. Just bring 1-2 cups of water to a boil, turn it off, and place the white chocolate chips inside of the bowl on top of the pan, and stir together until its all melted. I like to add 1 TBSP of coconut oil to my chocolate when melting because it helps it melt a bit easier but it will work fine with or without it. 4. Place melted chocolate in a piping bag or ziplock baggie and drizzle over the top of the Rice Krispie Treats. Top with more sprinkles! Its best to let them sit for a few hours before cutting, otherwise the marshmallows are too hot and they don't stay together great!